I think colored pencils are great especially for those who don’t like using the classic eyeliner and are willing for a new twist in their makeup routine. There are many techniques and tools how to achieve a look that will suit you best. 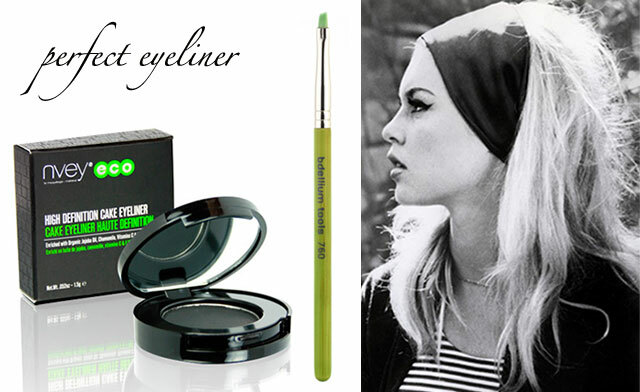 The first option is to use a normal eye pencil in a selected color and draw a line on the upper lash line. You can also enhance the color of your eyes by wearing just a colored line in the inner rim of the eye (see top picture). The best is to smudge the line (on the upper lash line) a little bit to achieve a nice colorful effect that pop out the color of your eyes. You can smudge it with a q-tip or with a smudging brush. Green makeup trick If you don’t have a colored pencil but would like to wear it anyway, check your eyeshadows and find that nice color you’d love to wear. 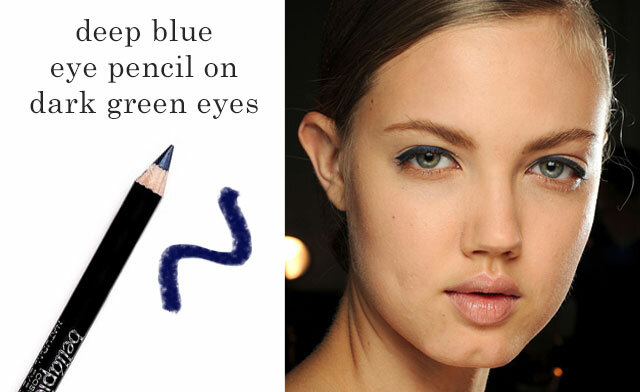 Next use a thin eyeliner brush, dip it into water and mix it with the eyeshadow. Draw the line and voila! You have a colored line! For the waterproof effect use an eyeliner sealer instead of water. 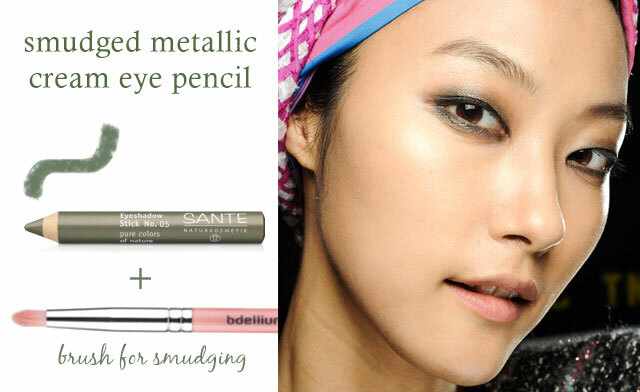 Find a creamy eye pencil – those thicker ones – in the shade you like and draw with it a line around the eyes. Then smudge it around the eyes with a q-tip or a brush to achieve the desired smudged effect. 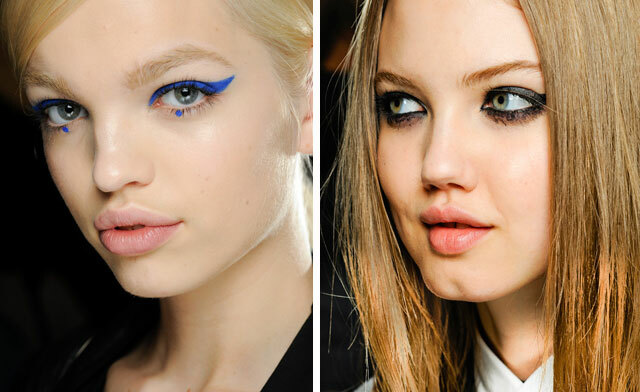 Apply a few coats of mascara and your eyes will literally shine! This kind of pencils are great in metallic shades! 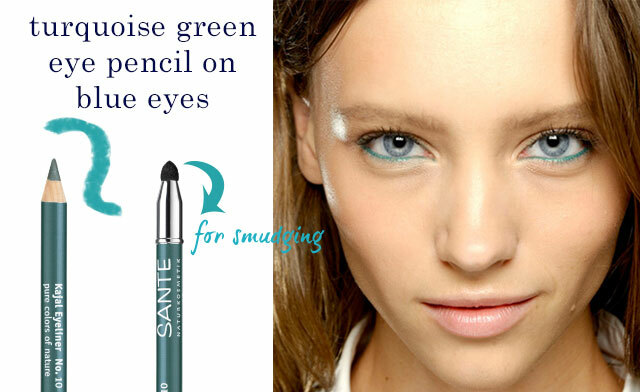 Green makeup tip Before applying any pencil, powder first your eyelid so that the line won’t smudge on your upper eyelid. Do you use any colored pencils? Which ones you like most? Are you afraid of using colors? It’s again time to review make-up brushes! I’m so happy to share with you my excitement about these new goodies that I like so much! Make-up brushes are really my “weak point” and I can’t wait for a long time without buying at least a couple of them. 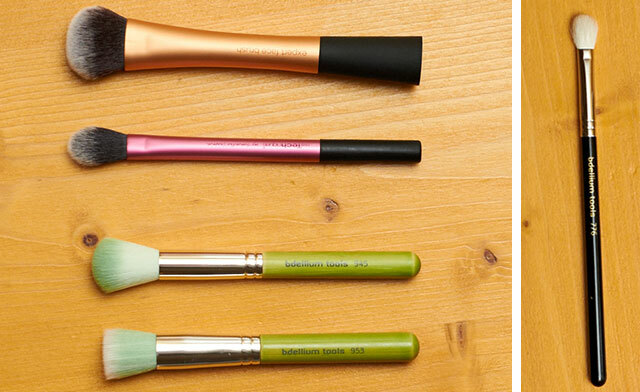 As you already know I love to test different brands, but I will start with Bdellium Tools that is one of my favorite brand of make-up brushes brands and my last beauty “obsession” from the green beauty world! I use this brush for a few months and I like it sooo much! It’s from the Green bamboo series, which means it has synthetic fibers, but because it’s duet-fiber it means that it is made from 2 different synthetic fibers. The green fibers are soft and come around the brush. While the (almost transparent) white ones are stiffer and allow together with the green ones to apply and distribute the product easily and evenly. 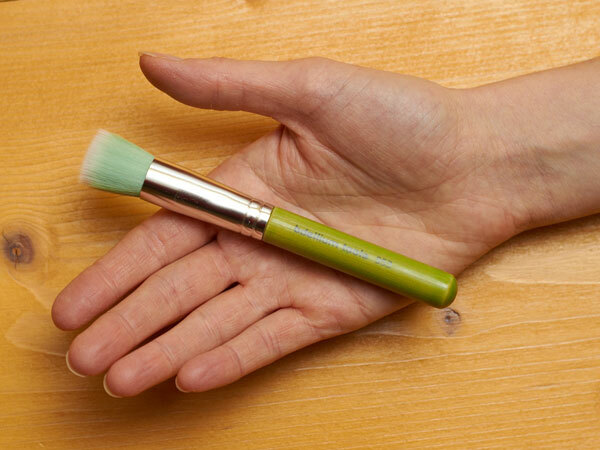 Because its quite small shape this brush is perfect for applying liquid products and I can reach all the small corners and areas on the face. If you try it and use it for yourself, you will find that your foundation is applied quickly. This brush is especially good if you have a thin face and so a big brush would be quite inappropriate. For instance, I use it a lot on myself cause I have quite a thin face and so its shape suit my face perfectly. However, it also depends which product you will apply with it; I love to use it with a nice tinted moisturizer or for liquid foundations with a light consistency, or even for distributing (stippling) the primer before applying the foundation. 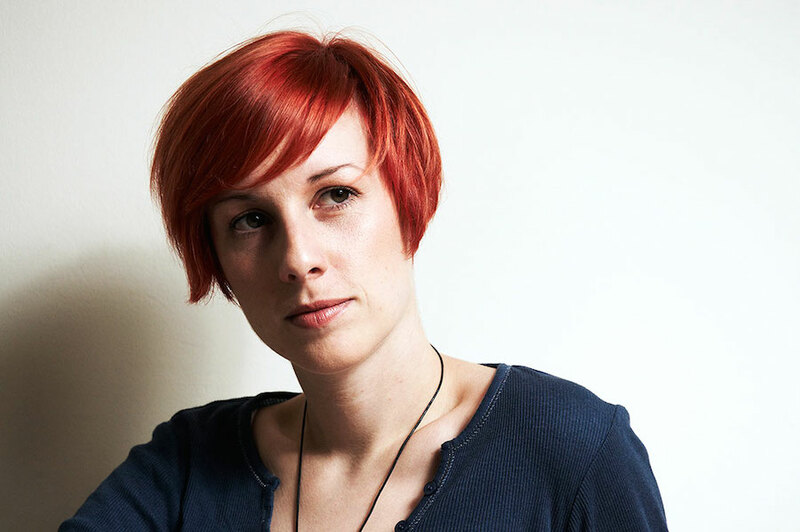 You can also apply with it liquid or cream blush when you want to get that subtle modern flush of color. Overall, I’m thrilled about this brush! NOTE I always forgot to specify that this kind of duet-fiber brush is not meant to apply the foundation in circular motions or with standard strokes (like with the classic foundation brush) but with a stippling technique. That means you apply your foundation with pressing it lightly into the skin in order to achieve the perfect skin effect. This is what it’s designed for. 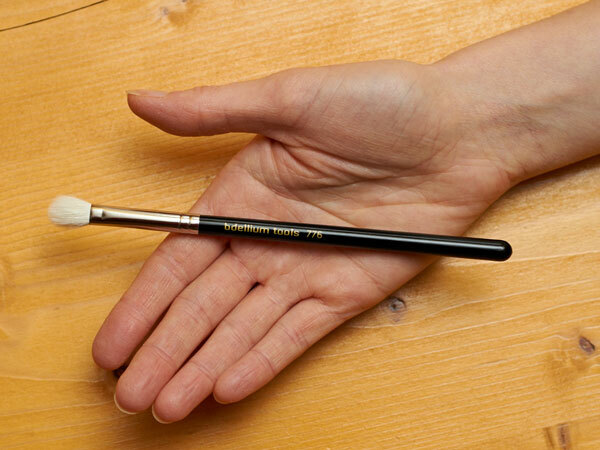 I really wanted to try even this brush because it’s so small and thin in shape. It depend on what I do, but in general I tend to use brushes of smaller sizes for applying powder or blush because this way I can be more precise and apply just small amounts of product where needed. And it’s also better to add smaller amount of product than to apply too much of it at once. This is also the reason why I like this brush and use it for many different things. The 945 is not duet-fiber, but it’s really soft. 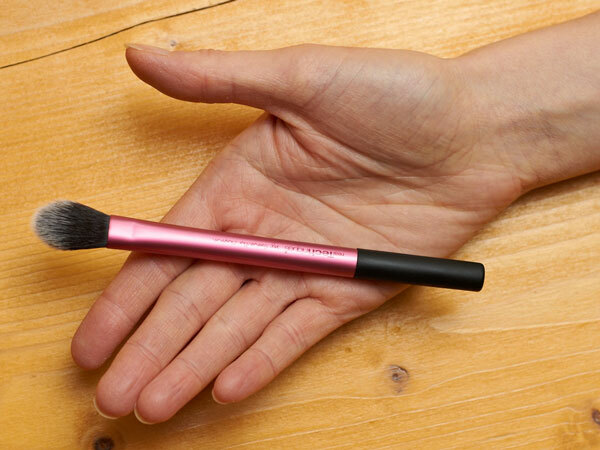 It is meant to be a contour brush which is fine for contouring smaller areas. But I like it even for applying blush when I have before me a face with small cheeks where a delicate sweep of color is needed just on the apples of the cheeks. I also use it for applying setting powder on smaller areas like underneath the eyes or around the nose for touch-ups. It can be used also for applying powder highlighters on top of cheekbones for instance. On the picture below you can see both brushes from the top. When compared they are similar in density but they have 2 totally different functions. This brush is from Bdellium Tools Maestro series that is meant to be a line for make-up artists and this series is also hand-crafted. I bought the 776 brush because I use it a lot and for some things is really irreplaceable. As you may know the first that launched it was MAC (with their 217) and did literally a cult brush, but this one is absolutely comparable to MAC and does its job perfectly. It’s made from natural goat fibers but Bdellium reassures they are cruelty free, because they don’t use fibers of exotic animals (like squirrel,..). Read more about this here. 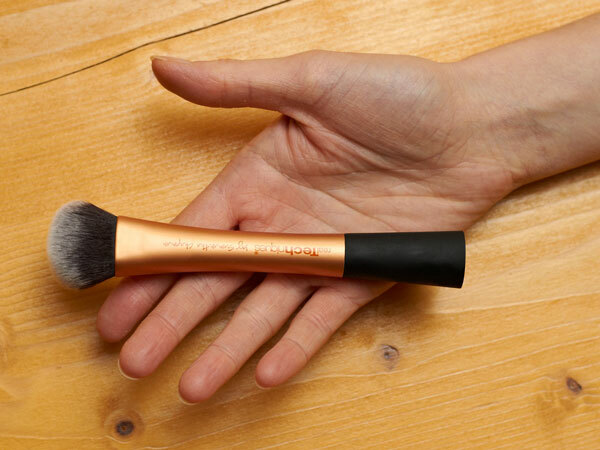 The specialty of this brush is that is not too big and it has soft fibers but they are “rigid” enough to blend the product well or to use it for blending even cream concealers. It does a fantastic job especially when used for applying liquid concealers under the eyes. Overall, it’s a must-have brush for every make-up artist especially in this HD era of precise make-up applications. Since I have heard many good reviews and suggestions about Real Techniques, I finally decided to give them a try. First, I wasn’t sure whether it’s all about marketing pomp or it is true. So I needed to try them in order to give an objective opinion. I am nicely surprised, because the brushes are very good and they are also nice designed. For the first time, I wanted to try 2 different shapes of their brushes. 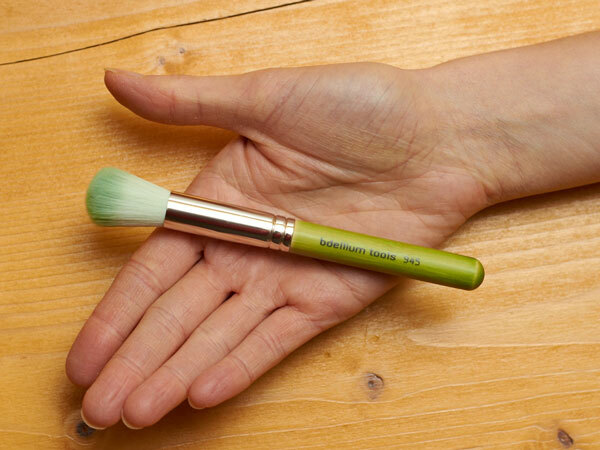 This is the first one: Flawless Expert brush which is quite dense but it has quite short bristles in comparison with its density which is fine because you can blend the liquid product quickly and easily, especially in bigger areas. You can use it also for applying powder but I don’t tend to use it that way. I prefer to apply with it liquid foundations, especially if there is a wider area of face/skin to work on. It’s also great for applying some creamy foundations as well. The foundation is quickly blended and in a few strokes. For those who don’t want to have an array of brushes like me 😀 I highly recommend this brush. You can do everything with it: apply your foundation, set the powder and even apply your blush. I don’t like to use it that way because I love changing brushes while I work, but for the main part of you it will work great. 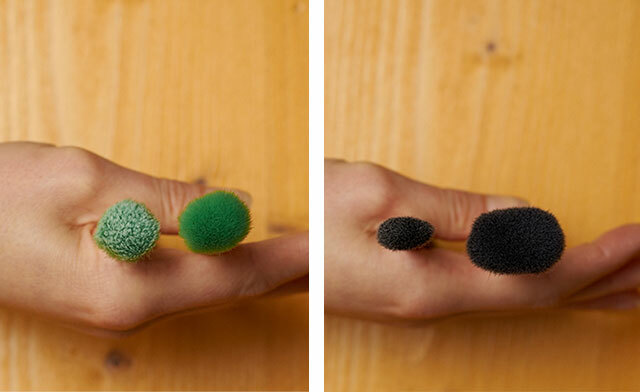 All Real Techniques brushes are made from very soft synthetic bristles and they have a very good shape of the handle that fits great in the hand. It’s also very interesting that they have the most part of the handle covered in aluminum. I think they are so light because of this. This setting brush is really a lovely one. It has a slightly pointed tip that allows you precise works like: setting the powder under the eyes or applying concealer. I also love it for applying cream highlighters under the brow bone, on the top of cheekbones, on the bridge of the nose,… I think this is a modern shape of brush that will work great especially for make-up artists and all who want a special type of make-up applications. These are all my last acquisitions that I really love to use and are absolutely my must-haves. If you want to purchase these products go to iherb online shop where they have very good prices! Use this referral code DAS325 during checkout and you will save additional $5 on your first order. Enjoy your shopping! 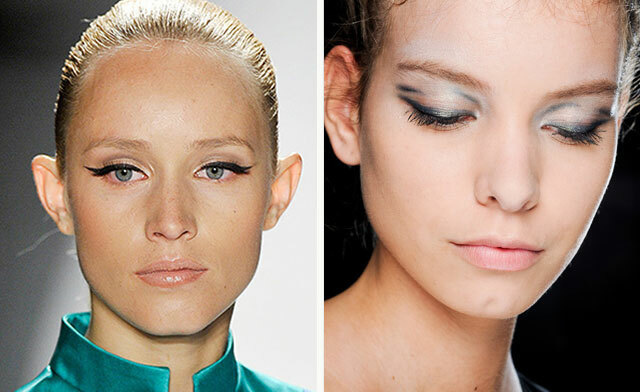 One of the most seen trends on catwalks this spring was the eyeliner in different shapes and textures. 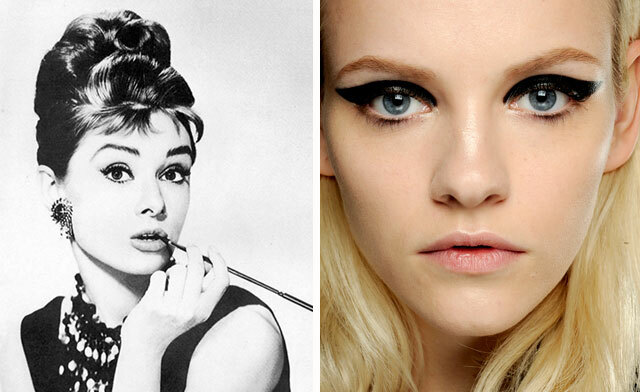 I decided to write a post in 2 parts to explain you the eyeliner tips & tricks. Before we discuss the technique of applying the eyeliner (that will follow in the 2nd part of the post), I’d like to present you the tools that you need to create the winged line and explain some different shapes of eyeliner. 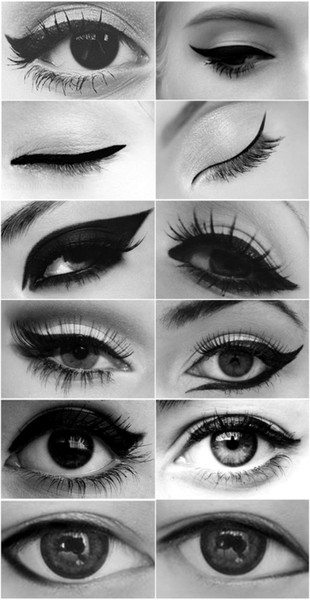 I have chosen many eyeliner looks to show you the difference and understand how the line and texture of the eyeliner change the appearance. 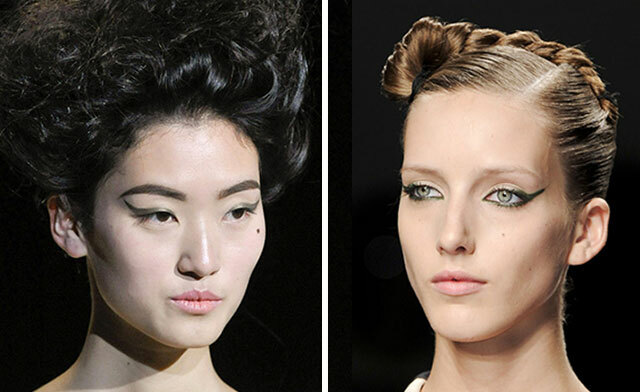 For instance, on the Jean Paul Gaultier runway the gel eyeliner was used around both eye lids and smudged to create a “messy” look. How can I wear the eyeliner? 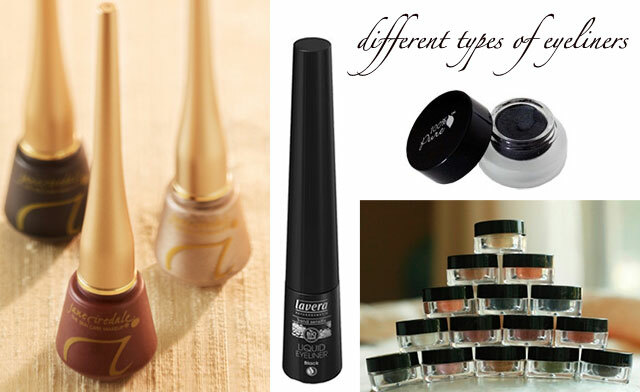 When talking about eyeliners usually we have in mind the liquid eyeliner with a small incorporated brush that is a “nightmare-to-apply” for many women 🙂 Fortunately, this is not the only option and the greatest news is that you can choose between different types of eyeliner and you don’t necessarily have to use the incorporated brush to apply the eyeliner. You just need some skills and practice to do it well. But most of all, don’t be afraid of it, otherwise the result will really be a mess! 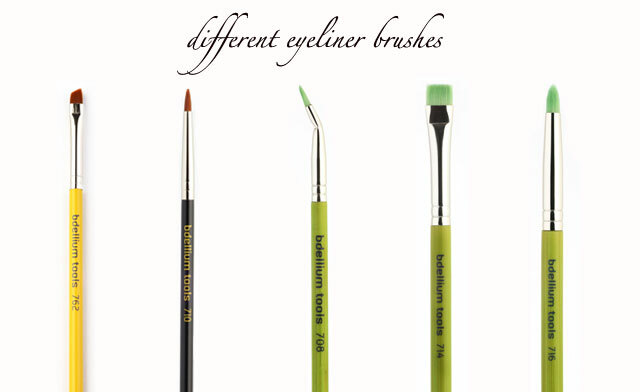 Check here the review of Bdellium makeup brushes from the green line.